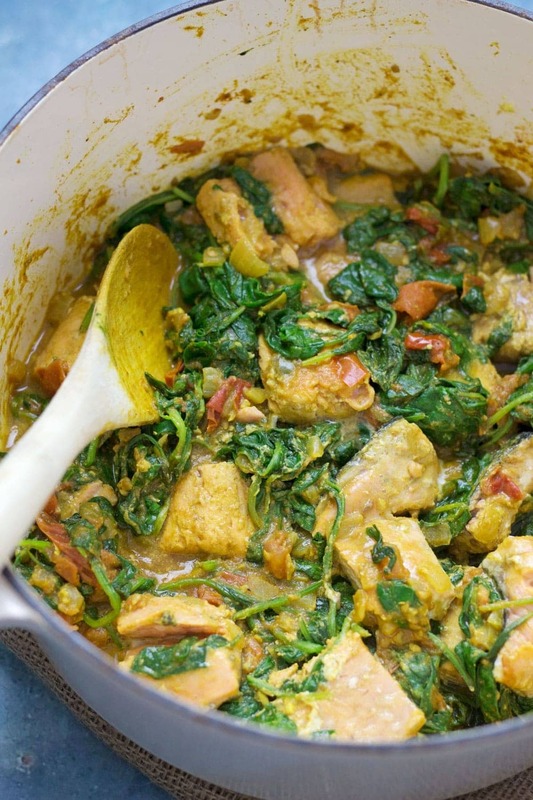 Salmon curry with tomatoes & spinach is a tasty change from a traditional curry recipe. Not only that but the spinach, tomatoes and salmon make it a healthier option too! I think it’s definitely one of our favourites in this house and we love it any which way. It’s one of those things, like pizza, that can be perfect in so many different forms. 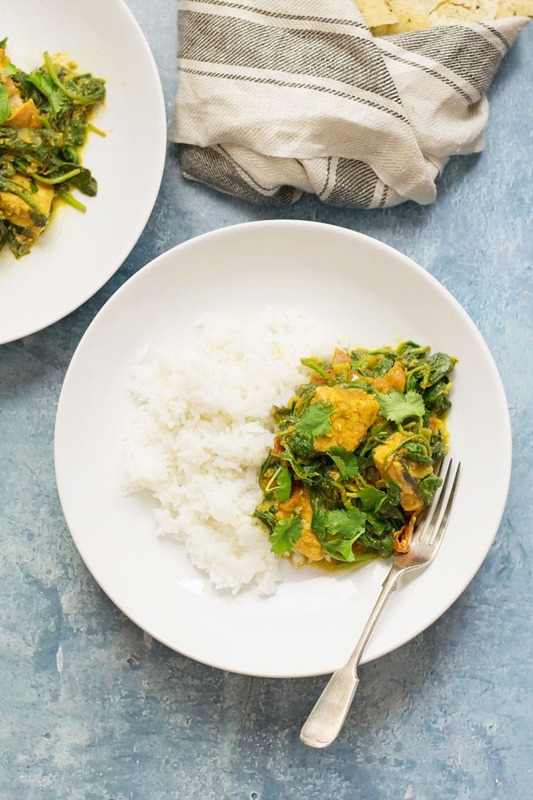 Whether it’s a greasy take away which amounts to thousands of calories and sleepily collapsing on the sofa after eating or a fresh, healthy and relatively light version like this salmon curry. They all have their places and if you’ve got it in your head that curry can only be an occasional treat then think again! 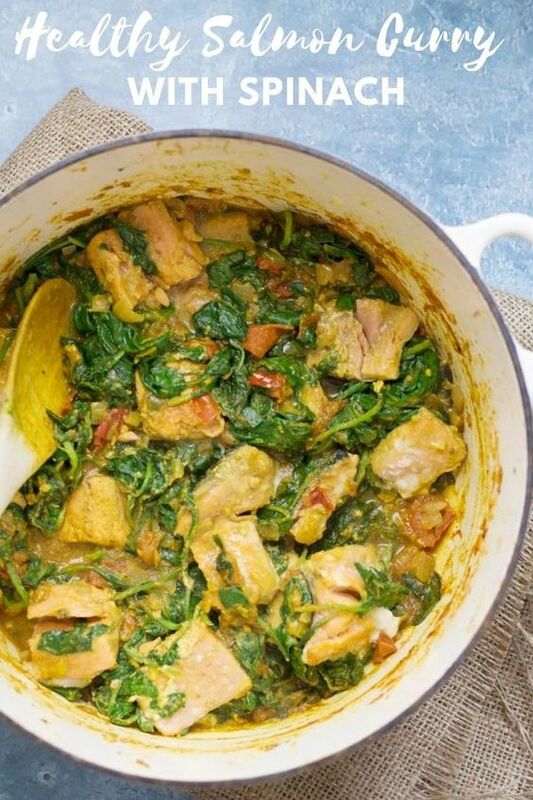 This version has a lovely tomatoey sauce which is full of curry flavour and coats your salmon and spinach perfectly. 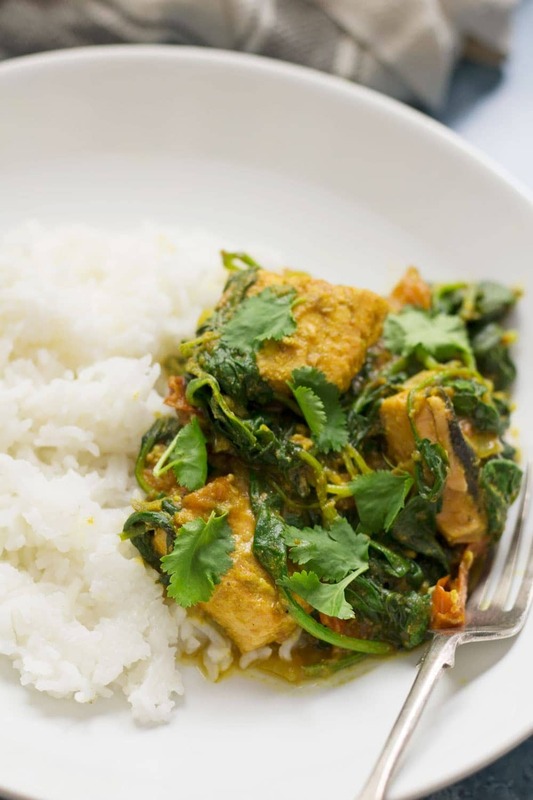 Then you’ve got the spinach which is one of my favourite curry ingredients and of course the salmon which is full of like omega 3 or whatever good stuff. Add extra vegetables if you like, I’ve kept it pretty simple here but pretty much anything would work! Did everyone have a good weekend? It’s was our first weekend together in a few weeks because Will’s been away quite a bit so we had a very chilled one. We went to a local farmer’s market on Saturday as a reward for going to the dentist (grim) and we bought some steaks to make my steak sandwiches with chimichurri so watch out for new photos coming soon! Then on Sunday we just stayed in and got various household activities done including organising our food cupboards and making a spread sheet of everything we have (yes, we are that cool). Want more? Try these other salmon recipes! 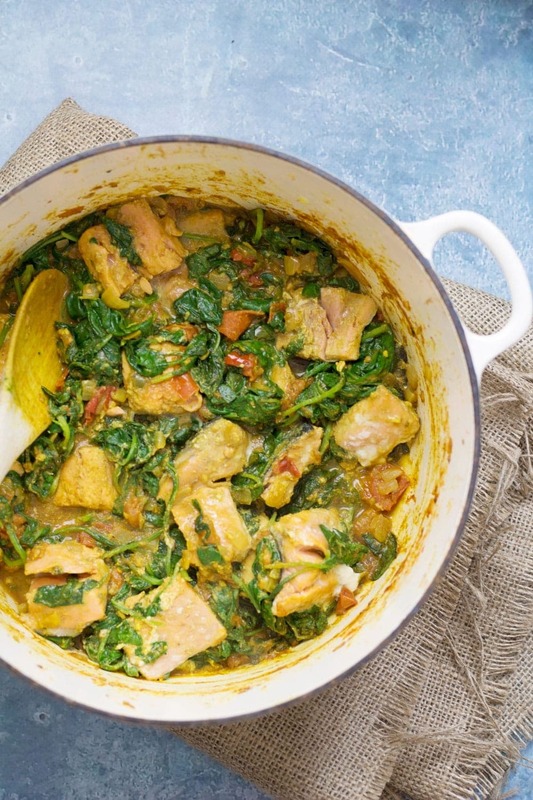 Salmon and tomato curry is a tasty change from a traditional curry recipe. Not only that but the spinach, tomato and salmon make it a healthier option too! Heat the oil over a medium-high heat. Add the cinnamon stick, peppercorns and cloves. Cook for a couple of minutes. Add the onion and sugar and cook for another 10 minutes until caramelised. Add the cherry tomatoes and stir. Cook until the tomatoes start to break down. Add the rest of the spices along with the ginger and garlic. Cook for another 10 minutes and then add the spinach and cover for two minutes so that it can wilt. Add the salmon to the pot and stir gently into the sauce. Cover and allow to cook for about 5 minutes until the fish is cooked. 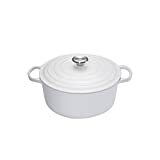 Serve with rice. I’m raising both hands right now because I love curry so much! I’ve actually always been curious about how it would taste with salmon because I’ve never tried it or seen it at a restaurant. This looks so delicious! I love curry and this sounds so good, especially with the cinnamon. 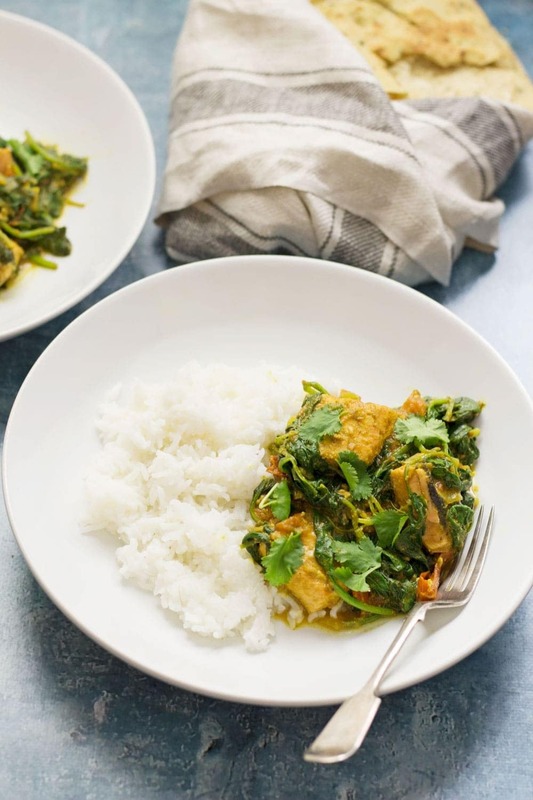 I love fish based curries but can’t say I’ve ever tried one with salmon before! Fab idea! OMG, a spreadsheet of everything you have? You are totally organized, girl! 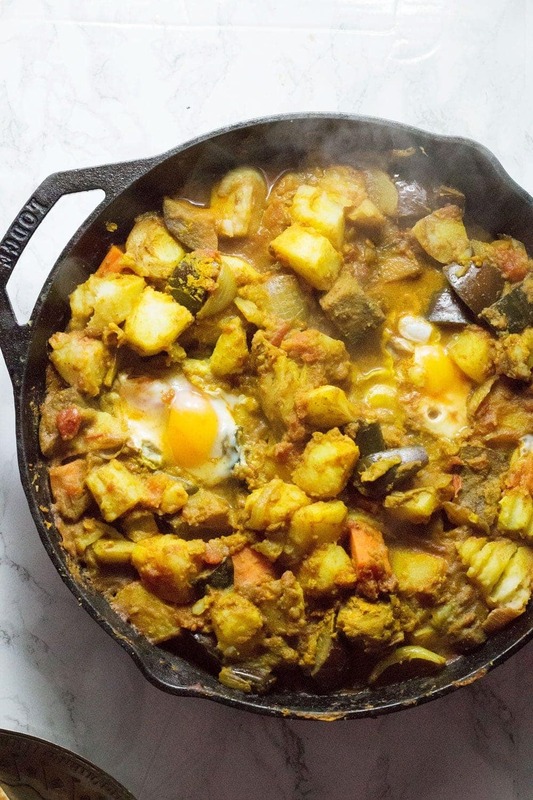 This curry looks divine! I’m definitely giving this one a try! I love all the ingredients in this dish! I will be making it very soon. Salmon and spinach with tomatoes and a hint of cinnamon sounds super delicious to me. This sounds delish! Love the flavor combo and your pix are great!